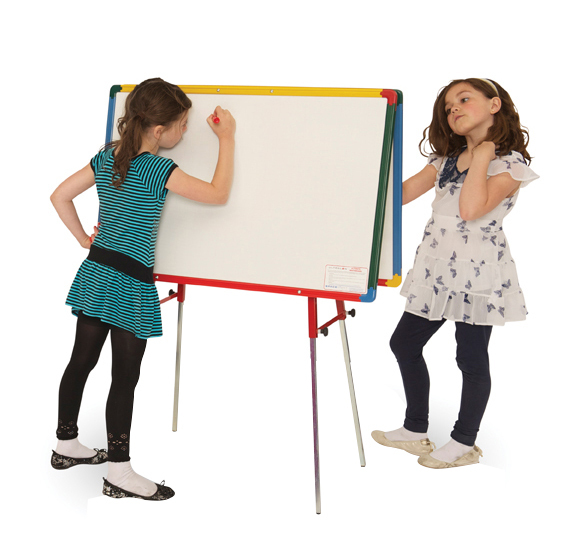 This is a double-sided whiteboard easel with height adjustable legs so can accommodate most ages. Ideal for use in pre-schools, playgroups and primary schools, it has a bright harlequin coloured frame with rounded safety corners. Choose from 3 surfaces - non-magnetic, magnetic and chalk. The non-magnetic surface has a faint 25mm grid for writing and charting alignment. This junior easel is delivered assembled and ready to use. It also comes with a clip on pen/book ledge.